Having not long since turned pro the band were looking for more stable promotion, having been let down a number of times by their current agents. They had built up a good relationship with Hampshire band Wishful Thinking who they had supported at gigs in Newquay. After being particularly impressed by their cover of the bands own “Peanuts”, they put them in touch with their manager Bob Potter. Bob is a something of legendary figure in the entertainment industry. Over the years he has represented some of the biggest names in the industry as well as running large clubs in the Surrey area. (For those who are familiar with Peter Kay’s ‘Phoenix Nights’, the Brian Potter character is based on Bob). The band made the trip up to Surrey to audition for Bob, who decided to take the them on. With Bob’s clout the band were able to secure some more lucrative and higher profile gigs. A large number of these gigs were now located in the less provincial areas and more in the big cities and swinging London clubs, such as the Scotch of St James and the Cromwellian, where they shared the bill with many of the top London mod bands of the time such as Timebox and The Red Squares. In early 1967 the band made their first trip overseas, playing the in Storeyville clubs in Hamburg and Cologne. A representative from Storyville would visit the UK a couple of times a year scouring the country for talent and booking up the club for the year ahead. The band made their way from Cornwall to an audition in Essex, along with the rest of the Bob Potter stable of artists. Storeyville were impressed enough to offer the band a short residency alongside Wishful Thinking. Piled in ‘Lady Sandra’ and driven by chaperone Vic, the band would play gruelling evening gigs running from 7pm-1am, consisting of 45 minute sets followed by a 45 minute break and then back to do the same. At the time both Alan and Steve were underage, which caused some visa issues. Once in the country both were supposed to be out of the club by 10pm, which of course didn’t happened. The German trips were quite an eye opener for the band, not only giving them the opportunity to grow into a tight unit, but also experiencing the notorious delights and dangers the country had to offer. One eventful evening at the Top Ten Club involved the local gangsters, police and a trip to the local hospital. 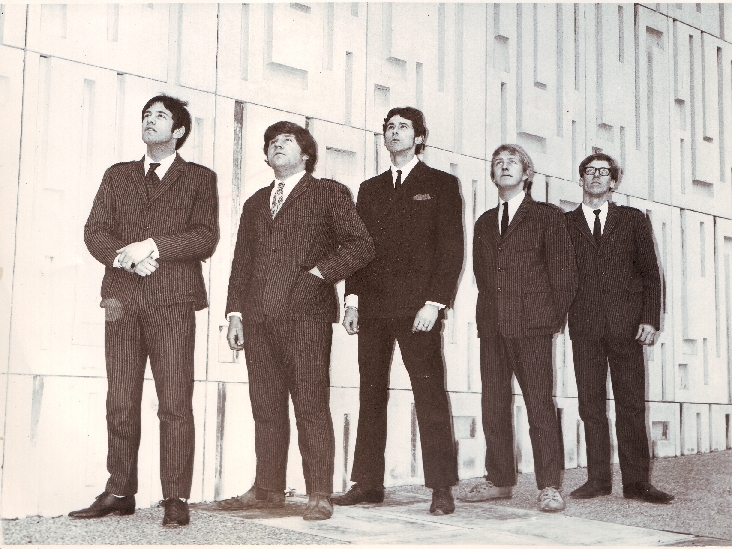 The band had built up a friendship with Ricky Barnes, who was managing the club at the time. Ricky had played sax with Tony Sheridan and was known for being for being a tough character and an even harder drinker. One night some visitors from a local ship kicked off in the club while the band were on stage. The waiters in the club would act as bouncers (often armed with electric truncheons), and during the ensuing mayhem one waiter was stabbed in the heart, dying instantly, while another was beaten with an iron bar. During the fight Ricky had been injured, resulting in a trip the hospital. Despite having been stabbed in the back and beaten with a shovel he still continued drinking beer through the small gap in his swollen mouth. A blood transfusion was required and Ricky nearly died, partly due to the shock of receiving a body full of alcohol free blood. Things were back to ‘normal’ the following night, although there was a heavy police presence along with the murky selection of local gangsters keeping an eye on their patch. The band even had protection from a shady gun toting character. A far cry from the safety of Cornwall’s village halls. Up to this point the band had been based in Cornwall, covering the length of breadth of the UK in ‘Lady Sandra’, however arriving at a Central London gig in a 33 seater 8 ton coach was no longer possible and Sandra had to go for a much more practical Ford Transit. With the number of bookings increasing the band relocated to a more central location around the summer of 1967, parking Lady Sandra up next to Bob’s place in Surrey. Shortly after they moved into a flat above Bobs studio when Lady Sandra was sold. The spirit of the bus did however remain in the form of bunk beds taken from the bus before she was sold. They would later relocate to a bungalow on the building site of what would become Bob’s famous Lakeside Club, where they could enjoy the fishing during days off. The band were soon forced to take on added responsibility with the sudden and unfortunate passing of manager/road manager Vic Cotton, who suffered a heart attack while out horse riding. Vic was a father figure to the band and his passing had a major impact on the band. At the time they were wrapping up a cabaret gig at the Webbington Country Club in Somerset, on the final night of their residency. Suddenly the band was on its own. All the new activity helped kept the band focused and their thoughts away from the passing of Vic, who’s ambition had played such an important role in getting this band this far. Bob Potter not only booked and promoted bands, he also had a small studio at the rear of his house in Mytchett, Near Camberley. Having started to build up a excellent reputation as a live band they decided to take advantage of Bob’s space and took their first forays the studio to try out some of the creative ideas they had been developing out on the road. The sessions at Bob’s studio were engineered by Dave West. Dave was a popular local DJ who also shot a lot of the band photographs for Bob Potter Entertainment. During these sessions the band had free reign to bounce ideas around and come up with some recordable material. The sessions showcased the bands varied style of music, from straight pop to the psychedelically tinged harmony pop they would become famous for. A Kaleidoscope of Colours was a popular live song and great piece of pop-psych, which included the bands only foray in to phasing, which Dave created by slowing the tape decks down and putting pressure on the reels when mixing down to a two track recording. The band had built up a friendship with Jamie Peters. Jamie had previously worked with Georgie Fame and Dusty Springfield and was beginning to make a name for himself as a songwriter and wasn’t much older than the band at the time. Jamie wrote the punchy pop of “I Just Had To Laugh” for the band, which was also recorded as part of the Mychett Rd sessions. Jamie would later work on Rare Bird’s mega-hit ‘Sympathy’, but turned down an offer to join the band as singer and bass player just before the song broke. The band also wrote a song called “In Harmony” for the Big T Band, another short lived Bob Potter band. The Big-T band recorded their own version in Bob Potter’s studio, however this has remained in the can and never received a release. Another track recorded during these sessions was the quirky progressive pop number “Climb That Tree”, which would be covered the following year by fellow Bob Potter band, She Trinity on the B-Side of “Hair” (President PT283. 1969). The single release was effectively an Onyx recording with vocals from She Trinity dubbed over the top. During this period the band were spending an increasing amount of time in the free studio space they had at their disposal. While no official release came out of these sessions it did give the band the opportunity to develop their knowledge and understanding of the recording studio, instilling a professional approach to the recording process.